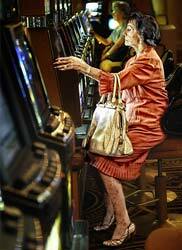 Professional gambler or not, you should know how to behave in the Casino. You wouldn't want to be marked as annoying person, or even to be more or less politely escorted out. As first, if the slot of your choice is occupied, you can choose another one. If not, you can always wait until it's free again. But, you cannot sit on player's shoulders while you are waiting, you cannot keep asking him if he will be soon finished or bother him in any other way. Be somewhere near, but not too near. If the smoking is allowed, go ahead. However, if you are a pipe lover, or you prefer the cigars, ask about it. In some Casinos smoking is still allowed, but that apply only on cigarettes. In addition, there are some smoking and non-smoking sections, so try to notice the signs. If you aren't sure, it's better to ask someone. You can watch someone else playing, but you cannot occupy the seat next to this person unless you are playing yourself. Someone else might be interested for that particular slot, and, to be honest, those seats are for the players. Besides, try not to disturb other players with your behavior or comments. It isn't polite thing to do, and as a result you could easily end up outside the Casino. Another thing you shouldn't do is playing on more than one machine simultaneously, especially if the place is crowded. There are several types of slots, and you may be occupying all the machines of the same type, while someone else is waiting. It isn't so bad if the place is half empty, by the way. How to be sure about what is acceptable or not? If you wouldn't be very happy if someone else is doing it, don't do it yourself. You wouldn't be thrilled about someone who is loud, annoying and impolite, sending smoke clouds in your face or occupy your favorite slot doing nothing. For some things you are not sure about, ask. There are not many rules, so try to obey them and have fun, allowing the same thing to the others.